There’s a time and a place for plastic drawers - they’re inexpensive, tidy, and they do the job well. But, frankly, they’re not necessarily the most aesthetically pleasing way to store a makeup stash. 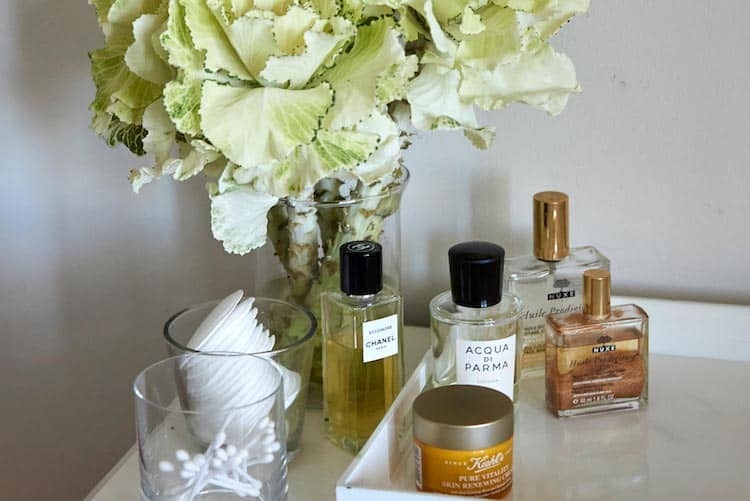 Recently, we’ve been dreaming up ways of incorporating our beauty collections into our interior décor, while still keeping things organised and functional. So, here are six easy but sophisticated ways to store your products that you might not have thought of – and that will help you up your interiors game, too. Forget your preconceptions: mirrors no longer need to be left on the wall. Switch up your décor by popping a beautiful gilded mirror on your vanity to corral your products – the mirror adds interesting texture and the products’ reflections add an extra layer of prettiness. Add a few trinkets – some earrings or loose change, for example – to keep it from looking too contrived. 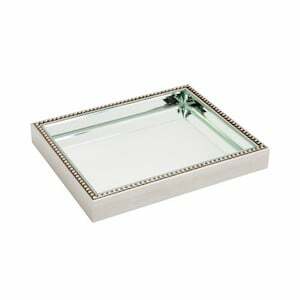 Choose a mirror of your liking; we’re fans of this chic Temple & Webster mirrored tray that instantly makes things more luxe. Short on storage space? Maximise wall real estate with some hanging wall shelves, so you can show off your beauty stash without clogging up valuable room. 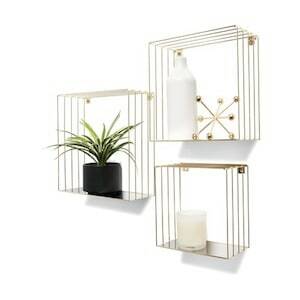 Functionality meets beauty with these dreamy shelves from Kmart – the pop of gold will brighten up any room (and is so Instagrammable). 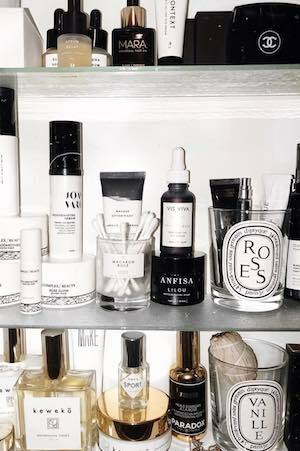 Plus, your beauty collection will look so pretty, you won’t have to worry about buying wall art. Ah, yes – candles. 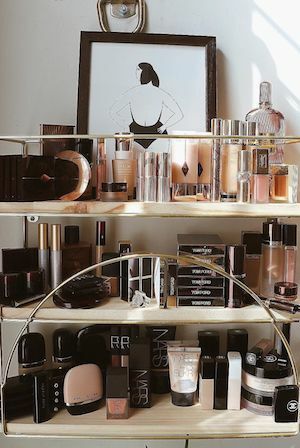 Storing your makeup brushes in empty candle jars may be a classic hack, but we like to go even further with our candle organisation obsession; the opportunities are truly endless. Think cotton buds, mascaras, eyeliners, lip glosses… you name it, it’ll look even better in a chic candle jar. 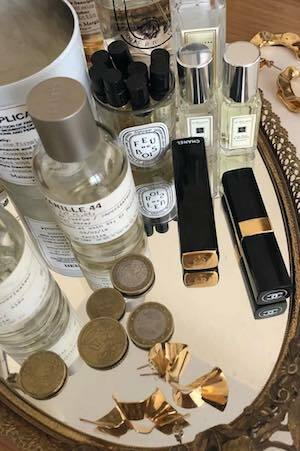 Mix up a few brands so it doesn’t look too samey – we’re big fans of Diptyque, Jo Malone and Aerin. If you were looking for an excuse to #treatyourself to a beautiful new candle, here it is. There’s just something about marble that makes everything look more refined, isn’t there? We can’t think of a material that is a more timeless choice – it’ll never go out of fashion and suits pretty much every interior style. 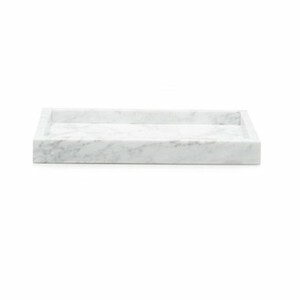 Try organising your products in a slick marble tray, like this beauty from Country Road. Trust us: it’ll give you instant style cred. Got some magazines laying around? You’ve already got yourself a storage solution. Pile up some of your favourite mags (hint: pick ones with spines that work well together) and top it off with a statement tray. 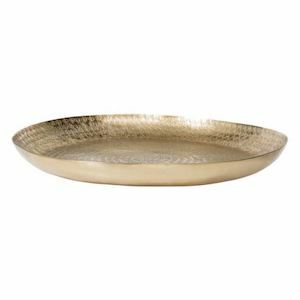 This platter from Freedom is perfect for the job – we love its muted gold hue and it’s the ideal size for storing your beauty faves. 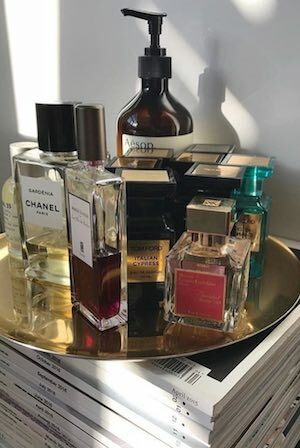 If you just can’t quit your acrylic storage – and don’t worry, we totally relate – a practical but eye-catching box may be the simplest way to ease yourself into a slightly more sophisticated style of organising products. 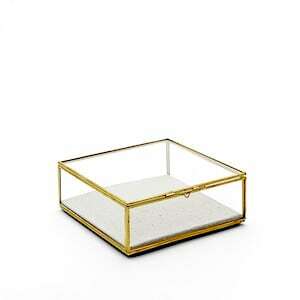 Next time you’re thinking of purchasing the same set of drawers to accommodate your (ever expanding) collection, opt instead for a stylish glass box, such as this West Elm offering. It’s beautiful but neutral enough to go with any other décor – yep, even your trusty old plastic drawers.